So as most of you know Expression Engine (EE) is my favorite tool for deploying feature rich and dynamic web sites. It's a true CMS, unlike what was running grantmx version 3.0, that unnamed blogging tool. Nonetheless, as much as I think EE is the best thing since the invention of watermelon; out of the box, it does lack a few things I typically need when deploying client sites. But lets be honest, what CMS/Blogging tool ALWAYS has everything you need "right out of the box" for EVERY situation? User - A must buy for any site requiring custom member management templates. Freeform - The excellent replacement to EE's default contact form. LG Social Bookmarks - Although you can add social bookmarks to your sites manually, LG Social Bookmarks makes multiple social site bookmark deployment quick and easy. Pages - A quick and easy way for your clients to add, remove and modify pages. Playa - complete awesomeness when relating multiple entries from multiple weblogs. Edit Tab AJAX - The easy way to sort entries in your Edit tab. Word Limiter - A EE default plugin, but quite handy for those summaries on the home page. Image Sizer - Total awesomeness when you need to compress and resize images clients may or may not know how to edit. XMLGrab - If you ever need to pull RSS feeds as entries, this is the go to plugin. Set up a server Cron job for hands free updates. Pages Nested Menu - A must when using the pages module to easily create a dynamic navigation. EE Gravatar - This plugin allows you to easily insert a "globally recognized avatar" image from Gravatar. I want to also note that most of these add-ons will be available in the default Expression Engine 2.0 package, due out this year. 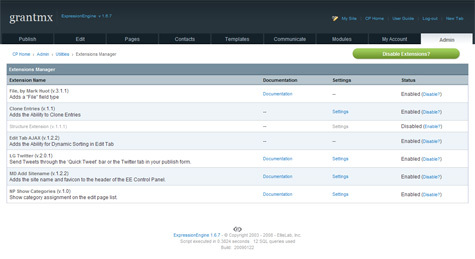 For ExpressionEngine 2.x there is the free HJ Social Bookmarks plugin which is similar to LG Social Bookmarks.